"I'm Eddie Felson. I shoot straight pool." 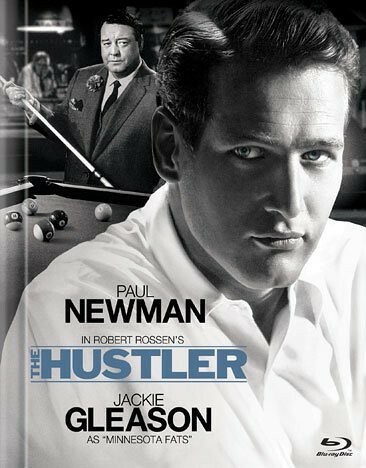 Robert Rossen's The Hustler is based on Walter Tevis' novel of the same name and stars Paul Newman as pool player "Fast Eddie" Felson, a man so focused on his goal he has no idea how to accomplish it because he spent so much time building up his talent he ignored building up his character. The opening prologue reveals Eddie to be a con man. He pretends to be drunk and suckers money out of a bartender. But those were low stakes. Eddie is after Minnesota Fats, known as the best pool player in the country. But Eddie isn't there to "gamble money on pool games." He wants to take Fats' crown away. Fats plays in New York at Ames pool hall, so that's where Eddie and his stakehorse Charlie (Myron McCormick) go. In an earlier time in a different part of the country, they would be drawing to determine who was the fastest with a gun. Eddie stumbles out of the gate, admiring Fats who shoots pool "like he's playin' the violin or somethin'." After playing for more than 24 hours, Eddie's up over $10,000 and Charlie points out they've won as much as they'd hoped, but Eddie won't leave until Fats gives up. And Fats doesn't give up because his stakehorse, the darkly dressed Bert Gordon (George C. Scott), tells him to "stay with this kid; he's a loser." As the hours continue to pass by, Eddie dwindles away his winnings and seed money, until all he's left with is $200. The next day, Eddie ditches Charlie and makes the acquaintance of Sarah (Piper Laurie), first at a bus depot and then in a bar. Her rich father has put her up in an apartment, and though she doesn't look young enough for it, she attends college on Tuesdays and Thursdays because she's "got nothing else to do on Tuesdays and Thursdays." The rest of the days she drinks. They take up with each other because they each need somebody. Eddie thinks he's conning her to get a place to stay, not fully aware she let him. They assume it will be temporary, like most people in their lives usually are, but they soon develop feelings for each other. Eddie is obsessed with getting another match with Fats, but needs to raise a bankroll of $3,000. He tries it on his own, but his pride gets in the way, resulting in both his spirit and his body broken. He takes Bert up on the unbalanced offer he initially refused, reasoning "a 25% slice of something big is better than a 100% slice of nothing." Sarah wants Eddie to leave the life because all the people in it are "perverted, twisted, and crippled," but he won't listen. He gathers the $3,000, but at a tragic cost. He returns to Ames and wants to wager the whole thing on one game. No playing around. One shot, and if he loses, he'll head back to home Oakland, but Eddie's feeling it. The Hustler is an outstanding film. It's a great story brought to life by a talented cast at the hands of a capable director. The grittiness of the city and the lives of these people is visceral, thanks in part to Academy Award-winning work of cinematographer Eugene Shuftan and art director Harry Horner and set decorator Gene Callahan. 20th Century Fox commemorates the film's 50th anniversary with a 50GB Blu-ray disc housed in a 24-page digibook, though the cover is flawed with Newman's image, augmented to accentuate his blue eyes, taken from a different film and Gleason's image reversed. The video has been given a 1080p/MPEG-4AVC encoded transfer displayed at 2.35:1. The picture is impressive. Blacks are rich and don't crush. Combined with the bright whites, they make for strong contrast throughout. Also, a wide range of gray shades is apparent. Natural film grain can be seen. Clarity is an issue at times due to the source, which on occasion uses a limited depth of field. The print looked clean, free of dirt and damage, though there was a very minor bit of aliasing coming off Eddie's jacket when he returned to play Fats at the end of the film. The audio is available in DTS-HD Master Audio 5.1 and the original mono mix is in Dolby Digital 2.0. The 5.1 option is adequate though a bit of overkill considering the source resulting in a front-heavy, dialogue-driven soundtrack. Kenyon Hopkins' jazzy score fills the surrounds and little else does, aside from some ambiance. Dialogue is always clear and understandable, but the ADR frequently sounds flat. The Blu-ray offers new Special Features along with those from the previous Special Edition DVD. The new items, all in HD, are: "Paul Newman at Fox" (27 min) covers his films at the studio and his relationships with actress Joanne Woodward, director Martin Ritt, and writer A.E. Hochtner. "Jackie Gleason: The Big Man" (12 min) examines his performance as Minnesota Fats and his career. "The Real Hustler: Walter Tevis (19 min) is a featurette that honors the novel's author through interview of his family and one his own on the radio in 1984. An excellent commentary track is pieced together from separate interviews with Paul Newman; Carol Rossen, the director's daughter; editor Dede Allen; Stefan Gierasch, who played Preacher; assistant director Ullu Grosbard, Time Magazine film critic Richard Schickel, and writer/producer Jeff Young. Interview sessions with Newman, Piper Laurie, Michael Constantine, Dede Allen and others are edited into two interesting featurettes about the film: "Life in the Fast Lane: Fast Eddie Felson and The Search for Greatness (12 min) and "Milestones in Cinema History: The Hustler" (28 min). Another piece about the film, "The Hustler: The Inside Story" (25 min) includes people not involved with it such as pool historians and writers and even actor Jerry Orbach. Fox also licensed the A&E Biography - "Paul Newman: Hollywood's Cool Hand" (44 min) from 2003. Pool-centric featurettes include "Swimming with Sharks: The Art of the Hustle" (10 min) with writer R.A. Dyer and pro pool player Max Eberle talking about hustling. Eberle shows off some trick shots. Pro pool player Mike Massesy is featured in "Trick Shot Analysis by Mike Massey" (14 min) offering commentary on shots in the film and then demonstrates five of those shots in "How to Make the Shot with Mike Massey" (4 min). To paraphrase Big John, look, friend, I am not trying to hustle. I don't never hustle people when I recommend films. Get yourself a copy of The Hustler on Blu-ray because it's presented well in high definition and comes with special features that will enhance your understanding of the film, its creators, and the game of pool. Then check out Martin Scorsese's sequel, The Color of Money, with Newman earning an Oscar for his return to the character.